Meatless, hearty and flavor-packed, this Rotini with Roasted Vegetables and Olives is simple enough for any night of the week. For the last few weeks and from what I can surmise, the next several weeks to come, I am seeking out transitional recipes. 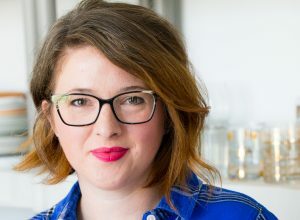 Recipes that take my family from Winter to Spring and that offer comfort in these early, crisp days of Spring but that shed the heaviness and richness of traditional Winter fare. Recipes that bridge the gap between Winter and Spring and leave us feeling satisfied and content. Pasta is a food that is so often connected with the idea of heavy comfort food, but simple changes can take it from feeling weighty to feeling light and healthy. Especially when you add a mountain of colorful, roasted Spring vegetables and use a healthy, fiber rich pasta like Dreamfields. The combination is intensely satisfying while leaving you feeling revitalized after a Winter of decadent food. I was first introduced to Dreamfields back in November when I attended the Mixed conference. Dreamfields hosted a delectable pasta bar lunch that proved to be my favorite meal of the conference. Although, I’m a fan of most pasta, I felt delighted by the fact that this plate full of pasta was also full of fiber, something that I have come to realize is essential to maintaining a healthy weight and overall good feeling. I may have helped myself to seconds. 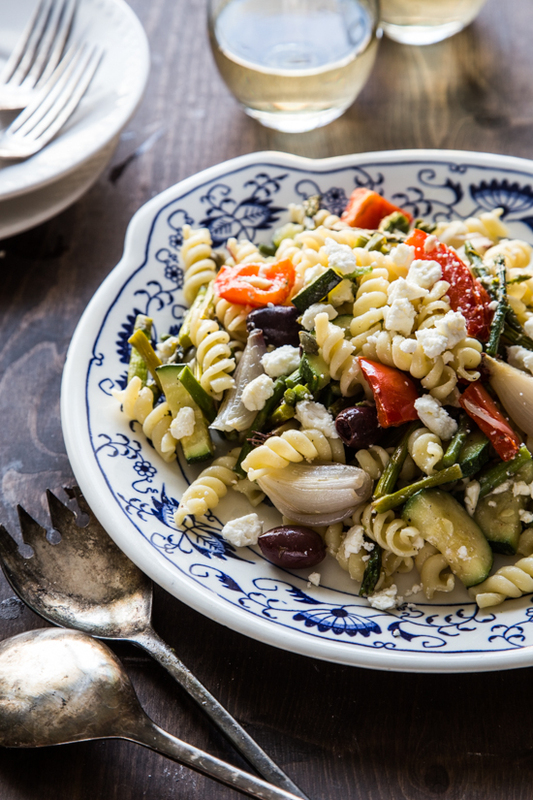 For this Rotini with Roasted Vegetables and Olives, I wanted to take some of my favorite Spring vegetables and roast them to bring out their sweetness. The asparagus, bell pepper, zucchini and shallots become beautifully golden and their flavors intensify during the roasting process. 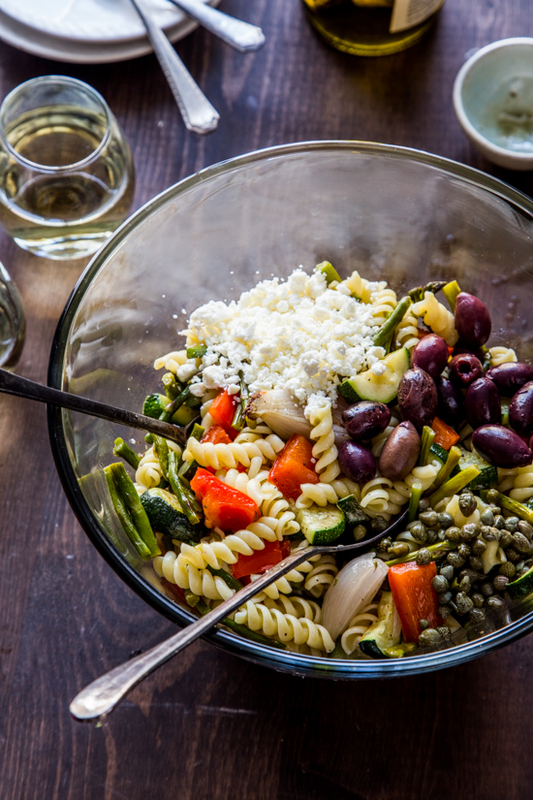 These roasted vegetables get tossed with Dreamfields rotini pasta, briny olives and capers then finished off with a sprinkling of tangy feta cheese and bright lemon zest. This recipe is a perfect, meatless meal for these early days of Spring. Perhaps when the days grow longer and the temperatures spike, I will create a chilled salad version of this recipe that would be perfect for a Summer time picnic. But for now, these roasted vegetables make this a foolproof, transitional recipe. To go along with this recipe, Dreamfields is generously giving away a case of pasta to one lucky Jelly Toast reader. 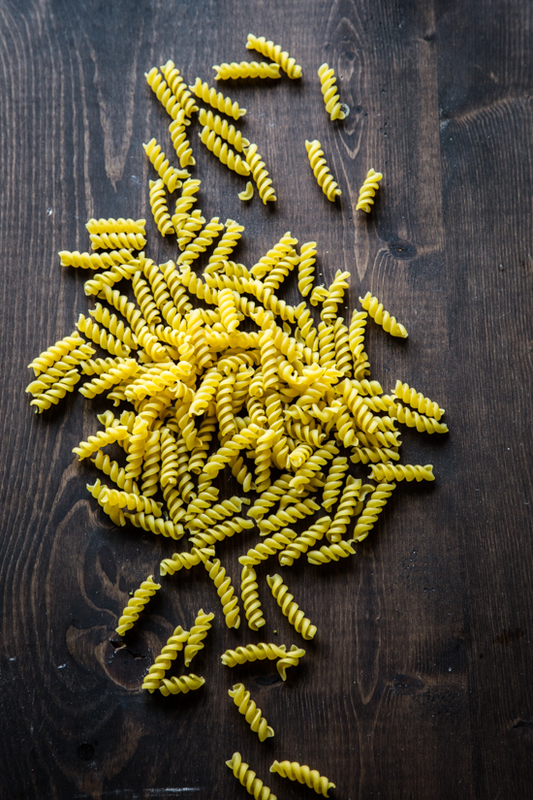 Use the widget below to enter for your chance to win 1 case of Dreamfields Pasta – and scroll down for my complete Rotini with Roasted Vegetables and Olives recipe! Visit the Dreamfields website, Facebook and Twitter to learn more about their delicious, healthy pasta. Preheat oven to 450 degrees. 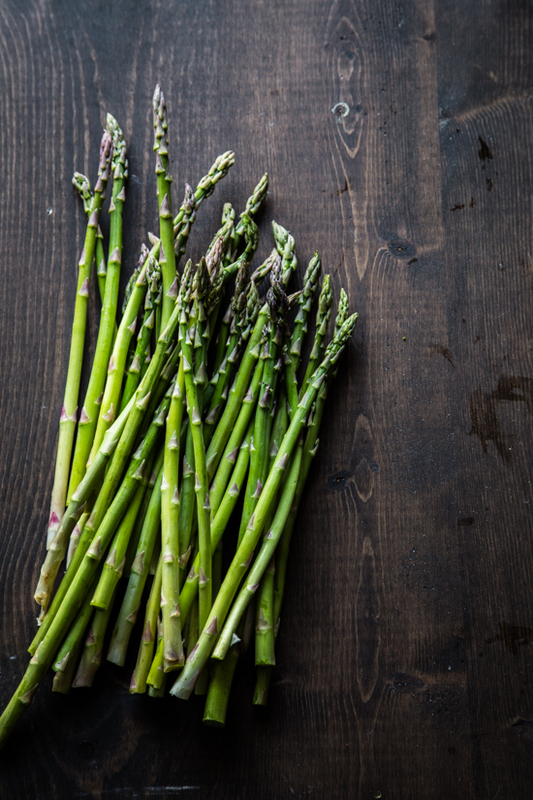 Spread asparagus, zucchini, bell pepper and shallots on a rimmed baking sheet. Drizzle with olive oil and season with salt and pepper. Roast for 15 minutes. 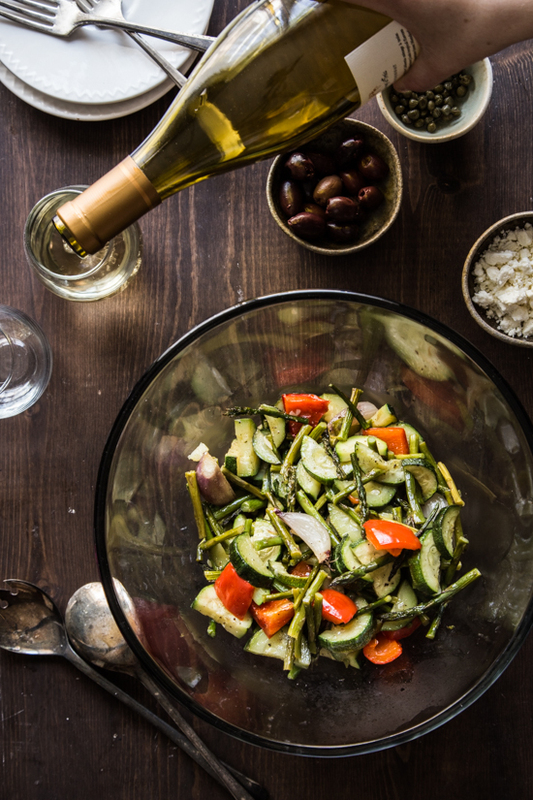 Remove baking sheet from oven and drizzle vegetables with white wine, and toss to coat. Roast for an additional 7-10 minutes or until veggies are golden and tender. In the mean time, bring a large pot of water to a boil and cook pasta according to package directions (for me, it was about 8 minutes, but check your pasta starting at 8 minutes and be careful not to overcook). Drain the pasta and pour into a large bowl. Add roasted veggies, capers, olives, feta, lemon zest and vinegar. Toss to coat and serve. *Disclaimer: This post was made possible by Dreamfields. Dreamfields provided me with pasta and compensation for my time. All opinions are 100% my own. My favorite pasta recipe is a special treat – Lemon spaghettini with Dungeness crab. following Dreamfield’s too Not sure if you wanted the comment here or in the rafflecopter…. My favorite will always be the classic comfort food, mac and cheese. I like to make a pasta dish with different seafoods, blanched veggeis and a creamy sauce, I change it up depending on the season and what’s on sale, and sometimes add fresh herbs from the garden! I’m following Dreamfields o Pinterest! I’m following Jelly Toast on Pinterest! I like to make spaghetti with shrimp,basil and lemon. I also follow on pinterest. I’m following jelly toast on instagram. Following jelly toast on pinterest. I’m following dream fields on pinterest and instagram. My favorite pasta recipe is whole wheat penne with marinara and freshly grated parmesan. Simple and delicious. I follow Jelly Toast on Pinterest. I felt the same way when I first tried their pasta; filling without all the guilt. Love the use of roasted spring veggies with this pasta dish, one of our favorite ways to enjoy the early produce. My favorite pasta recipe is goulash, which is basically just spaghetti with elbow macaroni – it’s so yummy to cook the noodles in the sauce to give them extra flavor! Love a good pasta bake or just noodles with butter and parm! I followed both you and Dreamfields on Pinterest! And I am following Dreamfields (HealthyPasta) on instagram! My favorite pasta dish would be Rigatoni with smoked cheddar and herbs in a creamy white sauce. Probably pasta a la vodka! 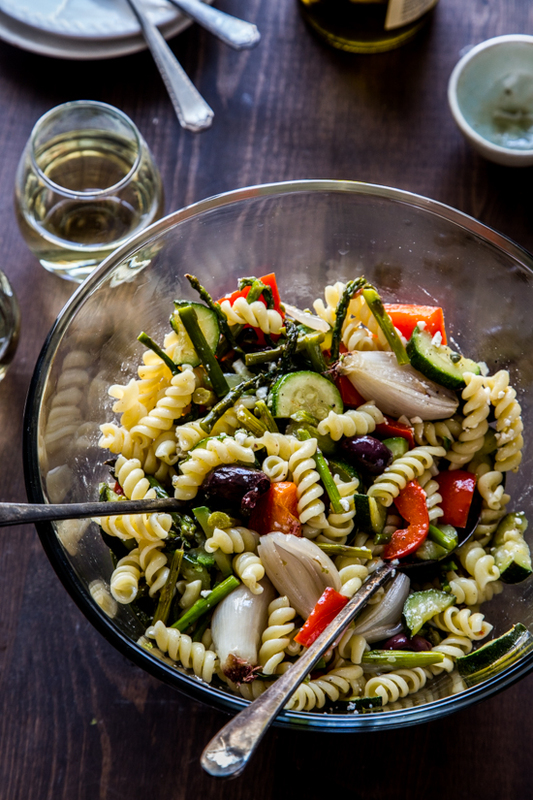 I love pasta salad with veggies and olives. Spaghetti and we just started using Dreamfields Pasta and we really like it. Following Dreamfields and JellyToast on pinterest. What a gorgeous pasta Emily!! I love olives and capers so this is totally my jam! I like the Rotini with Calamata Olives, sliced grape tomatoes tossed with red pepper flakes, lemon juice and topped with Feta Cheese! My favorite pasta dish is pesto pasta salad with roasted vegetables! Yum! Oh I love Chicken Cacciatore over noodles! Love these new recipes. I’ve been using Dreamfield for years now – especially Linguine. Use it with left over chicken and fat free ranch dressing. I love to toss bow-tie pasta with summer squash, fresh tomatoes, parmesan, garlic, and olives. Thank you for the wonderful giveaway. This seems like such a nice, light, springy meal! I love orzo pasta salad. I love Dreamfields pasta and have been using it for a couple of years. This recipe sounds heavenly and I can’t wait to try it. My favorite pasta dish is Dreamy Shrimp Scampi using DreamFields Angel Hair Pasta, fresh shrimp, garlic, and a low carb alfredo sauce! Yummy! I like any recipe that has shrimp! My favorite is spaghetti with marinara sauce and mushrooms! My favorite pasta recipe is one I make with artichoke hearts, sundried tomatoes, feta and pasta. I dress it with olive oil and balsamic vinegar. Fav pasta recipe is one I learned how to make in Italy…so I call it Pasta Italiano 🙂 I need to post it on my blog! Easy & fresh. Your pasta looks amazzzzing! Dreamfields has been our favorite pasta for nearly a decade. We love it in all its forms, but probably my favorite thing to make with it is fettucini with chicken and sundried tomato garlic cream sauce. My favorite pasta is orzo with feta, tomatoes, and black olives! I think my favorite pasta recipe is Ree Drummond’s Sister Pasta. So easy, but so delicious!